Welcome to the first edition of the independent Nonprofit Quarterly, published under NINA, the Nonprofit Information Networking Association. 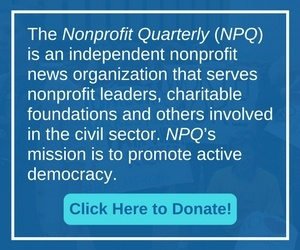 As members of NINA’s newly constituted board, we are thrilled to deepen our participation and commitment to NPQ, a venture that we believe is critical not only to the development of the nonprofit sector but also to the continuing revitalization of an active pluralistic democracy through nonprofit work. NPQ adheres to the principles it espouses. It is fueled by the energies and aspirations of those in whose name it does business, the kindness, not of strangers, but of you, our colleagues. At this time, the board would like to acknowledge a particularly important group of passionate supporters who volunteered to shepherd NPQ through its transition and continue to work vigorously on our behalf: our “Kitchen Cabinet.” They include David Brown, Lisa Chapnick, Rick Cohen, Pablo Eisenberg, Cynthia Gibson, Scott Harshbarger, Paul Light, Deborah Linnell, Bob Ottenhoff, Jon Pratt, and David Renz. The Nonprofit Ethicist tackles cozy boards, and questionable funding practices. Do Big Names Really Draw Big Bucks? If ever there was a bit of conventional wisdom that needed to be challenged here it is: “Big names on your board will translate into big funding.” This research suggests—that ain’t necessarily so. A uniquely exciting story of how one symphony revitalized itself even while in a potentially fatal organizational crisis by reconnecting with its core assets: the people it touched. The crimes of Ken Lay and Jeff Skilling have helped focus attention on their equally misguided use of philanthropy for personal gain. Cohen shows the dark side of these “generous” benefactors, their misuse of philanthropy, and how some nonprofits were happy to go along. In Whose Interest: Do National Nonprofit Advocacy Organizations Represent the Under-represented? A recent study raises serious questions regarding the legitimacy of the “representing the under-represented” argument for funding advocacy groups. Is founders’ syndrome dependent on personal and organizational characteristics? This research, looking at world-class programs where founders have remained involved over decades, suggests it may be. This article examines some of the key areas of ongoing nonprofit regulation, as well as emerging trends confronting government officials. This excerpted chapter from a much anticipated book by the National Centre for Nonprofit Enterprise provides a concise, easy to understand framework to help nonprofits understand the legal and other considerations in managing investment income. Every organization should have an in-house expert on nonprofit regulations, and that expert should train others in the organization about what is required.